It oft happens that the curbstoners or unlicensed dealers pose themselves to be the private dealers, but do the business without a “Vehicle Dealer License”. That is why, the first and foremost thing to consider before buying a used car is to confirm the authenticity of the concerned dealers. You will be surprised to know that nearly 80% of the cars sold online, through classified ads, are coming from the illegal car dealers or curbstoners. Before buying a car, you need to visit as many reputed and licensed dealers in your vicinity as possible. In this way, you will see that the prices vary from dealer to dealer with same specs, warranty and overall condition of the vehicle. In addition to it, you may also find a golden opportunity of coming by a car that is in perfectly good condition and has a considerably long period left for its warranty which may cost a little bit higher, but you will be enjoying the taste of a brand new car. As you are going to buy a used vehicle, the outlook of the car you choose to buy might be just fascinating, but the machinery and other internal parts could be even in the worst condition. That is why it will be a wise and sensible decision to go for the thorough inspection of the selected automobile by an expert, so that you may avoid any unfortunate discovery or shock after its purchase. After the expert has carried out thorough inspection and also notices some damages to the engine or other hidden parts, you need to ask them to prepare a written repair estimate, so that the same amount may be subtracted from the price they demand. By doing so, you can not only save a substantial amount, but also avoid future worries and lead a pleasurable life with the best travelling companion. There could by many motives behind the ultimate decision of the owner to sell their car, including damages caused by accidents, too old version of the vehicle with outdated specs, and so on. However, the owner may also be belonging to elite class of the society, who is going to sell the older one only to buy a new, comparatively advanced and more expensive automobile. 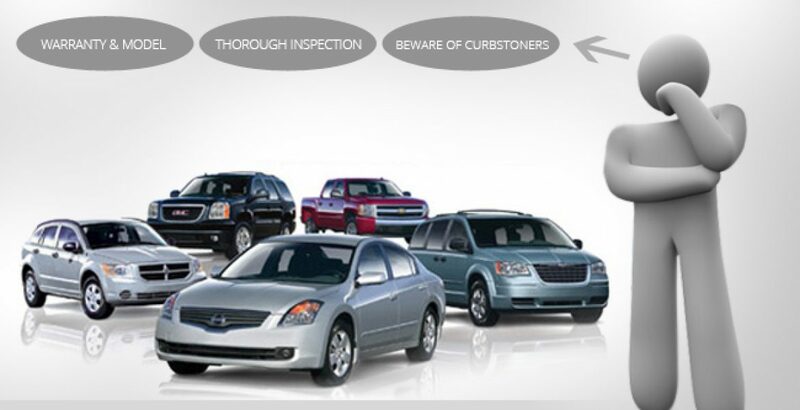 So, a test drive will enable you evaluate the overall performance of the vehicle. In the present era where you can find a plenty of fraudulent people around you, it should be one of your major priorities to get a written purchase agreement from the dealer, so that you may avoid any unexpected complexities in future. It will prove to be very beneficial if you just try to get the vehicle’s history report as you will be having better understanding about the overall condition of the car under question. By doing so, you can easily come to know of the dates and details of accidents, insurance policy, import or export, licensing, manufacturing, and so on. To avoid legal issues, you need to check the driver’s license and registration documents of the vehicle. At this point, you need to find the chassis and engine number on the documents and tally the same with that inscribed on the vehicle’s chassis and engine, respectively. The unlicensed dealers, usually, pretend to be the legal owners of the given vehicles, and try to sell them to their friends or family members. Sometimes, they also say that the vehicle belongs to one of their close relations, such as aunt, mother and sister, and that the owners want to sell as they are in the want of money, or want to purchase a new advanced car. If you smell a fault in the deal and notice a legal breach in this process, do not hesitate to file a complaint against the seller to the concerned government authority, so that the invaders of the vehicle laws meet with their ultimate end.